While some commentators argue that these charity abuses don’t amount to much, others disagree. But others disagree, seeing abusive foundation practices as eroding trust in charities while costing taxpayers billions of dollars in inappropriate foundation expenditures. The last major legislation trying to fix charitable abuses was too long ago -- 2002 Sarbanes-Oxley Act, aimed at private corporate abuses, led to some concerns among non-profit directors, but ultimately resulted in little change of regulations, behavior, and sadly norms. Perhaps the tired shibboleth that there is little appetite for increased federal oversight is wrong. Charitable organizations get substantial tax breaks at the federal, state, and local level – their tax breaks means higher taxes for us. At the federal level the tax break for charities is $64 billion in revenue not collected in 2017. To put that number in perspective, the tax expenditures for retirement plan contributions and earnings is over $140 billion. Tax breaks for the under scrutinized charities is one of the largest in our budget. After all these years of giving retirement advice and advising policy makers on retirement policy, I have come to realize the best financial advice is to delay claiming Social Security. 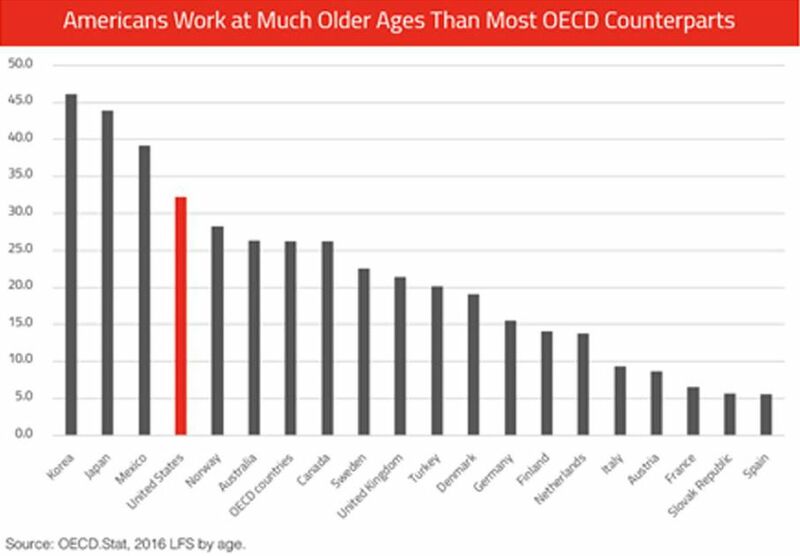 I am not saying that Congress should end people’s ability to collect reduced benefits at age 62. If you have no choice, then claim early. But for most of the 28 million older workers with the privilege of choice, I’d say that delaying is the best choice. Convincing someone to delay claiming is difficult. People like lump sums. Cold hard cash. And when pressed about waiting, they may say they have a higher chance of never collecting. Most people think they will die sooner than experts predict. On average, retired women think they will die a full 2.5 years sooner than the actuarial tables. This miscalculation will make you think delaying claiming Social Security is less valuable than it is. Because of this, the average claim age is around 63, even though benefits go up each year you wait until 70. For Wanda, spending down her $100,000 to delay claiming makes sense. I am assuming Wanda doesn’t have a fatal disease and doesn’t stick her head in a lion’s mouth for a living. Now assume Wanda is making the same as the average worker. Wanda can keep her $100,000 and claim Social Security at age 62, but she will only get $1,125 a month. Or, she could delay claiming Social Security until age 70 and get a much larger monthly $1,993 from Social Security. How would she get by in those eight years? She could spend down her $100,000 to get over $1,010 a month, just a little less than the $1,125, for eight years. But when she needs it the most, when she is older and more fragile, she will benefit from that monthly $1,993 if she can just delay. For people born after 1960, the Social Security system boosts benefits by about 7.41% per year between ages 62-70. If you were born before 1960, it’s more generous. In 2018, a price-indexed annuity of $1,125 at age 62 is worth about $291,000. But a $1,993 monthly annuity one had to wait for to collect in 2026 is worth $307,000 today! Social Security is worth a lot, and the value should be considered when calculating how much you need. Economists puzzle over why people don’t buy annuities even though they say they like them, especially if they think they will have a longish retirement. 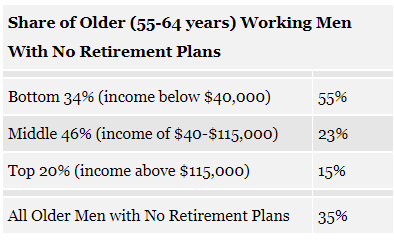 A 2018 study shows that 73% of respondents consider guaranteed income as a highly-valuable addition to Social Security (up from 61% in 2017) and people are less depressed and anxious if they have an annuity from a defined benefit plan rather than a lump sum to manage in a 401(k)-type plan or Individual Retirement Account (IRA). People want simple annuities. But, the annuity product is complex with a dizzying array of details and fees, like surrender charges, expense fees, death benefit fees, etc. Vendors also price them sky-high due to adverse selection. It is no surprise people don’t buy annuities on the open market. In short, delay claiming and get extra annuities from your valuable Social Security. The blog was assisted by Andrew Minister who will attend MIT for graduate school next Fall. I estimate that of the 12 million men between the ages of 65 and 70, 4.7 million have retired but can’t support a lifestyle anywhere near what they achieved while working. Maybe they have a spouse who can support them. Maybe they became hippies and live off the grid. But they probably eat less and do less. Medical research finds that financial stress causes health to get worse, so they likely will die sooner than if they had maintained their economic status. We all know the Econ 101 lyrics: the economy strengthens, labor markets tighten, wages rise. But we often miss the music: Solidarity Forever. Wages do not raise themselves. It’s when workers won’t take it anymore that employers feel the need to boost wages, when capital is willing to take less, and when prosperity is shared. Don’t forget another protest: there were “Occupy” movements in 70 cities and in as many nations. The grievance was plain, the remedies diffuse, the aggrieved self-identified. “We are the 99%” buttons and placards drove people to the internet. How much annual income did you need to be in the 1% in 2009? I did the work for you. In 2009, the answer was $983,734. In 2015, the answer was $1,483,596 according to the IRS. Income inequality will not fall without sustained growth and protest. 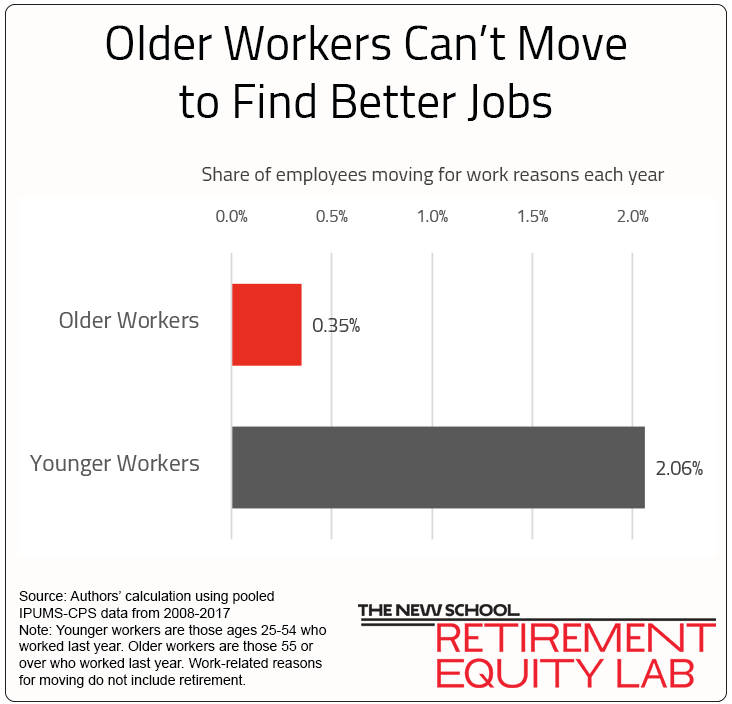 Our research shows that without real wage growth, it will be hard to save for retirement. The economy at the time of the Occupy movement was not hot. In 2011, we had just been through the worst economic recession since the 1930s, and the recovery was anemic. Many families were devastated. But government policy focused on strengthening banks and bank executive bonuses, and profits snapped back quickly. The 2010 bonuses in the financial sector – a total of $144 billion - could have lifted almost all full-time minimum wage workers out of poverty that year. Another stanza from Econ 101 is that economic growth helps everyone. This is the well-known mantra that rising tides – or hot economies - lift all boats. 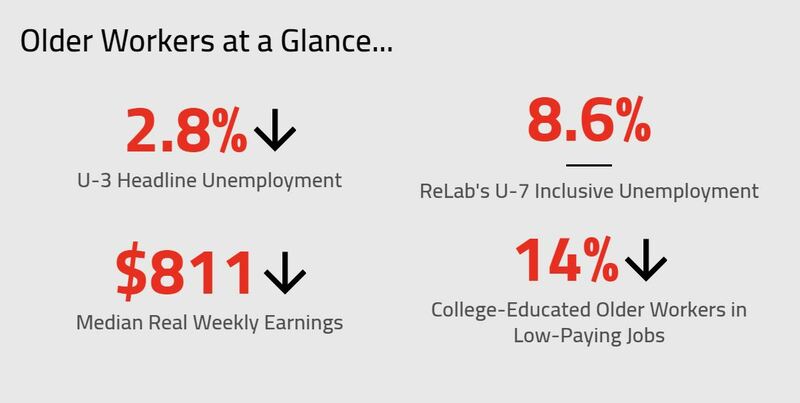 This means that economic growth shrinks income, economic, and opportunity gaps between classes. Even with the hot economy we’ve had since 2016, there is no evidence that the bottom is coming up or the top is falling. In 2018, signs are that the distance has only grown wider between the middle class, or the 40% of Americans with annual incomes between $12,943 and $34,504, and the top 5% who earn more than $375,088. 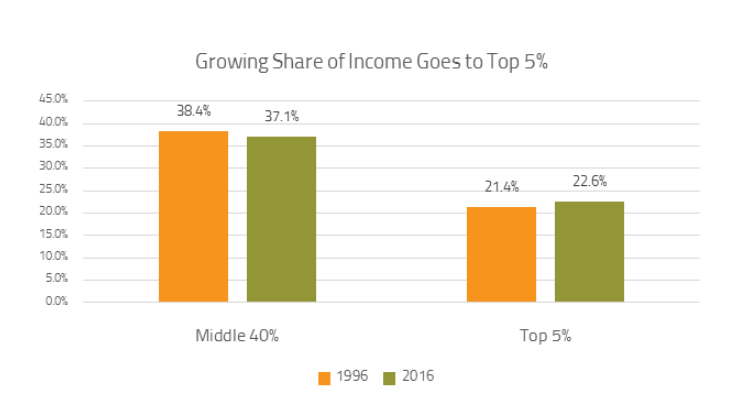 In the mid-90s, the middle 40% had 30% of all annual income, and the top 5% had 15%. In 2016, the share going to the middle class fell and the share going to the top 5% increased. The growing gap between the middle class and the very wealthy is caused by stagnant wages and rising profits. Since income for the middle class comes from work (earnings) and income for the top 5% from owning (stocks, bonds, businesses), workers did worse than owners in the last 20 years. Government rules and corporate power have made unions weaker, while laws have made owning more rewarding. Trump’s 2017 GOP tax reform law (almost all Republicans voted for it, and no Democrats, out of 240, voted for it) rested on the belief that raising corporate after-tax profits would give corporations wiggle room to raise wages and keep profits steady. Forgone government revenue – under this belief system – would be shifted to workers. Instead, the tax breaks allowed managers to buy stocks back from investors, causing stocks to go higher and wages to languish. In the economics textbooks, hot economies and tight labor markets cause wages to rise. Nothing in this hot economy signals that the middle 40% will benefit from this boom. Are we inviting another Occupy? Time to change the textbooks or time to change the rules? Thanks To Martha Susana Jaimes for research assistance for this post.